Today, my illustration for Hal Friesen's book 'Shepherd of Sparrows' is featured on Reality Skimming Press' page. 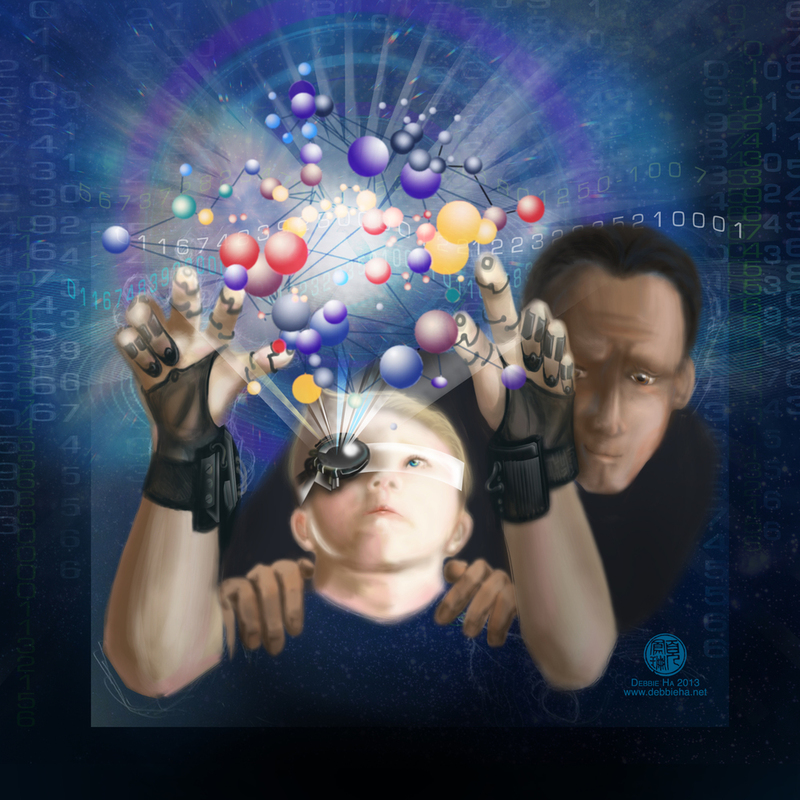 It shows a young Voltan using projection goggles and haptic gloves as his mentor, Prokhor, watches on. I intended to create a simple pencil sketch with colours thrown on after. Something like the 'Escaping Together' picture that I drew also for Shepherds of Sparrows. But the image in my head was in 3D with projected images of spinning protein molecules, a matrix-esque rain of numbers, and in the middle of it all, an young face beaming with concentration and hope. The image was so vivid; I HAD to turn it into reality. Debbie Ha (www.debbieha.net) draws an incredible depiction of Voltan and Prokhor from "Shepherds of Sparrows" by Hal J. Friesen. Music by Dan-O at http://danosongs.com In this illustration, we see the wonder of discovery through the eyes of Voltan, who has finally found a way to put his hyperactive mind to good use. I hope you enjoy watching the creative process. Here's a promise that you'll be seeing more digitally painted illustrations from me in the near future. Don't forget to take a look at Hal's new book, Shepherd of Sparrows, now available for sale in person (at his book launch on Dec 4th!) or online at amazon.com.